​Petey: A Story of Mutual Rescue is a memoir that relates my first two years with an American bulldog, and how his redemption ultimately becomes my own. My hope for this memoir is to show the extent rescue dogs can add depth to our understanding of mental health and healing, and how their gifts to us outweigh the hardships of living with those who have been abused. I want to support those who might be struggling with their own rescue dogs, and to show that perfection, competence and training are not prerequisites of what these dogs need most: love. ​"Petey: A Story of Mutual Rescue is a sweet and soaring story about taking risks, transcending abuse, and healing from without and within. Ishy Creo’s sensitive, poignant, and at times very humorous recounting of rescuing an American bulldog named Petey reveals how humans and animals in fact rescue each other." "A beautifully written, thoroughly engaging story about one couple's quest to discover the tainted past of their rescue pitbull. This book realistically portrays some of the issues adopters can face when taking in a rescue dog, but equally demonstrates how love, patience and devotion can win the day. Ishy Creo demonstrates an in-depth understanding of the relationship between man and canine, and how both can help each other overcome deep psychological issues resulting from past experiences. A heart-warming read, and a testimony to all those heroes who adopt rather than buy". ​"Petey: A Story of Mutual Rescue is a wonderfully personal, intimate look at the power of the human-animal bond, the power it has to heal the internal wounds both people and animals feel deeply, and the power it has to bring together people who share a love of animals and who want kindness to prevail." "Petey:A Story of Mutual Rescue by Ishy Creo tells about her first two years of adopting a rescued Bulldog. Insightful, and sometimes humorous, it tells of the trauma and insecurity felt by both. She brings us along for the ride and tells how love, security, understanding and the support of family and friends helped them overcome the issues they had experienced. A must read for anyone who fosters, adopts, volunteers for a dog rescue organization or is a dog lover. It certainly helped me as a volunteer and short-term foster." "In Petey, a Story of Mutual Rescue, by Ishy Creo, the writer shares a candid portrait of her coming of age in an America that did not equip her with the casual, neighborly, intimate social life that her grandparents assumed. On the spiritual canvas that came from urbanization and affluence, animals and nature might promise Ishy immense comfort. But that promise was deliverable only with conditions. What the writer took on in the withdrawn, defeated, heart-hurt Petey demanded far more than “mere” love of a dog. His needs were such that the writer had to learn to suppress a tremendous amount of her Self in order to serve his bent, stretched and patchwork spirit. To subordinate one’s own ego out of love is easy to promise over a glass of wine. To express that subordination in repetitive drudgery –and to see through those spilled meals, the many pee-pee accidents, the aloof demeanor,--and recognize love’s subtle shadow: this is the process that rescued the writer. She shares her spiritual journey with a casual and confidential voice that I recognized as the voice of a new friend." 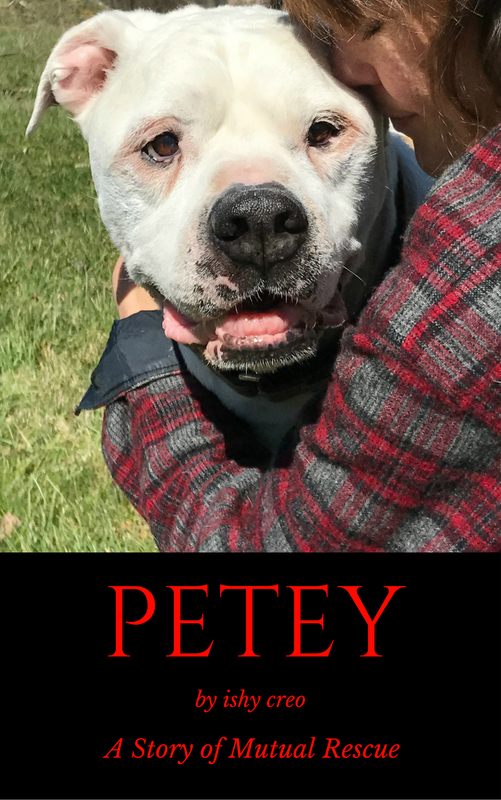 "Petey's story is a beautiful and painfully raw account about the real life struggles and challenges of both damaged dogs and the people who rescue them. I think anyone who has helped or tried to help an animal will see at least a little bit of themselves reflected in this brave and heartfelt tale." "In such a throw-away society people don't even care about throwing away their pets. For this reason, I hope Petey: A Story of Mutual Rescue will have the chance to do what it is meant to do, to help rescue pups and people going through the trials and tribulations that others have caused. Ishy Creo’s memoir and blog will reach people who could use her help and guidance with what she has gone through. Being the saving person is a bond we all want, but don't always get." ​--Christina Vaughn, Ayla's Acres Rescue, St. Augustine, Fla.
"I loved this book! It was not only a moving story, but it was very well-written. Ishy Creo has a compelling and insightful book about the first two years of her life with Petey, which shines a light on the experiences of animal rescuers everywhere. Petey: A Story of Mutual Rescue is not only an important book for everyone, but is one you will not want to put down, and one you will think about long after you finish the last page."